Life is hard, and the world isn’t fair. These are two lessons everyone learns at some point – but what if the lessons didn’t stop there? What if we could also learn to live well, despite difficult circumstances; to choose joy in the face of challenges; and to trust God through it all? Sara Frankl lived with chronic pain as a result of autoimmune disease called ankylosing spondylitis and was eventually confined to her home before dying at 38 years old. If anyone had a reason to focus on the unfairness of life, it was her. Yet Sara accomplished something few can, especially those enduring intense pain: she chose joy. 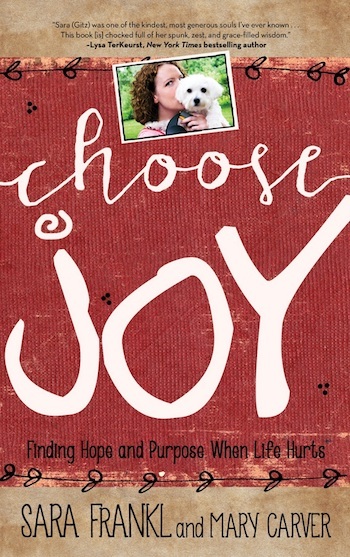 CHOOSE JOY is a must-have for those searching for meaning and beauty in a world full of tragedy. Her words breathe with vitality and life, and her stories will inspire smiles, tears, and the desire to “choose joy.” Readers will find themselves contemplating what really matters and move to reassess their day-to-day perspective on life. CHOOSE JOY is now available in paperback. Click here to order your copy today! Order your copy of CHOOSE JOY from one of these partners. Can I give you a gift? This hand-lettered print was made just for the #choosejoybook by Winsome Easel, and it is FREE for you. Simply hit the download button and find a meaningful place to display it, reminding yourself each day to choose joy. This is another FREE download, created for you to foster a conversation with your book club, Bible study, moms’ group, or just a few friends. Sara Frankl passed away in 2011 at the age of 38, but her legacy of choosing joy lives on. Known as “Gitzen Girl” or “Gitz,” Sara was a writer and an artist, a doting aunt and godmother, and a devoted fan of frozen Oreos, cute jeans, Harry Potter marathons, and the inspiring quotes she used to cover canvases, blog posts, and her walls. Though an autoimmune disease stripped Sara of the potential for a family and a future, she didn’t let that stop her from developing deep relationships through online communities that, even today, are inspired by her message of hope. Sara learned – and then shared – that a life full of joy is a matter of choice and no painful circumstance can take that from us. You can read Sara’s story on her blog, Gitzen Girl, and support her ministry with the Choose Joy Foundation. Mary Carver is a writer, speaker, and recovering perfectionist. She lives for good books, spicy queso, and television marathons, but she lives because of God’s grace. Mary writes about her imperfect life with humor and honesty, encouraging women to give up on perfect and get on with life, at GivingUpOnPerfect.com. She is also a regular contributor to (in)courage.me, MomAdvice.com, and MothersofDaughters.com. Mary and her husband live in Kansas City with their two daughters. 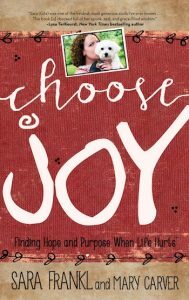 For media inquiries about Choose Joy, please contact Sarah Falter.